’جعلی‘ جہاد کے خلاف قلمی جہاد ! A Prophet or a liar? A Prophet or a poet? Qadiayanis / Ahmadis are nothing but the followers of a traitor, apostates and an infidel.They are also infidels as Mirza Ghulam Ahmad Qadiani's followers. The Muslims do not know them due to the lack of knowledge. The purpose of this site is to disclose the anti-Islamic character of these heretics and provide guidance to those who need it. Needless to say that it is the primary religious duty of every Muslim to alert other Muslims about this temptation (fitna) and support us to deal with it. Knowledge is a power! Who was Mirza Ghula Ahmad Qadiyani? Mirza Ghulam Ahmad Qadiani was the founder of the Non-Muslim Ahmadiyya Movement. He introduces himself to the world.Mirza says that I am not son of a human but am "such a place of human`s body that causes shame and hate: guess what? (Braheen Ahmaiyya part 5, page 97 Roohani Khazain volume 21 page 127, Dur-re- sameen old page 88, new p. 125). Who was Mirza Qadiyani?.please do guess it!Every man is best known to himself! 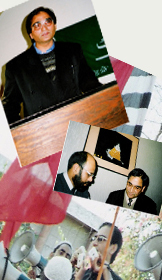 Was Mirza Ghulam Ahmad Qadiani a gentleman? The name of Mirza Qadiyani’s God is ”Yalash” (The collection of his Revelations: Tazkarah page no.379).Mirza claims "In fact between God and myself there are delicate secrets of which the world do not know and I have an inexplicable spiritual link with God. (Braheen Ahmadiyya part 5,Nusratul Haq p. 63, Roohani Khazain volume 21 page 81). Mirza lies in his throat. He writes: "I became pregnant and gave birth to a child and later made Isa (Jesus) from Mariam. (Mary). (Kashti-e- Noah p53, Roohani Khazain volume 19 page 68, Braheen Ahmadiyya part.5, Addendum p.old 189, new edition p.361 ). Mirza used to drink. One of his followers brought Tonic Wine. (Khatoot Imam to Ghulam page 5). Mirza qadiani made many false declarations. He claims also that he is a prophet, Jesus, a promised Massiah,Reformer, Mahdi, Hindue's god Krishan, David etc. .
Mirza Ghulam Ahmad Qadyani died of cholera on the 26th of May 1908. according to his father-in-law Mir Nasir Nawab. (Hyat-e-Nasir page 14).All’s well that ends well.